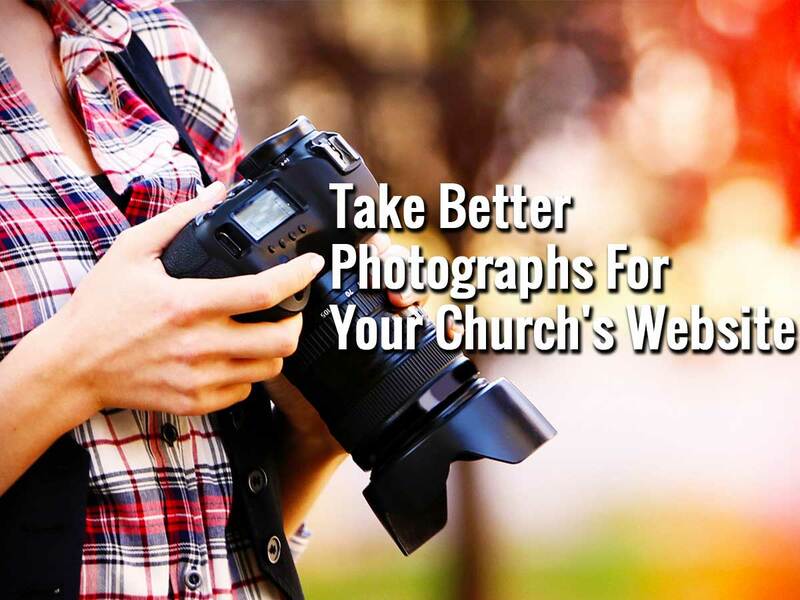 Do the photographs on your church’s website look professional? Does your landing page have top-quality photos that encourage visitors to explore other pages? Don’t allow bad photos to ruin a visitor’s first impression. Learn how to improve your photography skills. By taking a few simple steps, you can improve your photos. It’s easy with a little practice! First, don’t be scared to change your camera’s settings. Study the owner’s manual to learn what each setting does and how it can alter the appearance of a photo. Most inexpensive “point-and-shoot” cameras and cell phone cameras have limited settings from which to choose, but learning how to use them will enhance the quality of your photos. Explore the available modes, such as “landscape”, “snow”, “beach” and “portrait” – practice with each one and compare results. If you can’t get good results with your existing camera, consider upgrading to a DSLR (Digital Single-Lens Reflex) camera. While they are more expensive, DSLRs are very versatile, with automatic, semi-automatic and manual settings. They give you the ability to change lenses – you can choose from a portrait lens for close-ups, a telephoto lens for faraway shots, a fish-eye lens for capturing wide-angle photos, and other specialized lenses. Consider buying a guide to help you – from the basics to advanced techniques. Two excellent books to consider are “Composition Digital Field Guide” by Alan Hess and a more in-depth book, “Digital Photographer’s Handbook” by Tom Ang. Get out of automatic mode! If your camera has manual and semi-automatic modes, learn to use them. Buying an expensive camera won’t guarantee fantastic photos every time, but if you learn how to use it properly, your photography will improve. It’s not difficult and there are reasonably priced cameras available with manual settings and interchangeable lens capability. Consider purchasing used equipment from professionals. Using settings such as exposure times and aperture sizes may seem a bit intimidating at first, but with a little practice, you’ll find yourself using them routinely. The more you practice and experiment, the easier it will be to make nice photos consistently. The exposure and aperture settings work together to produce clear, sharp and properly exposed photos. You can start by adjusting the shutter speed. This controls the length of time that the shutter remains open and the amount of light that enters the camera. You need a fast shutter speed in high light situations – and to capture moving objects clearly. Low light situations require a slower shutter speed. Practice in different lighting situations and with still and moving objects. After you’ve mastered shutter speed, you can take control of aperture settings. Measured in “f-stops” (f/1.8, f/5.6, f/16, for example), the aperture controls the size of the hole that allows light into the camera when the shutter button is pressed. For most low light situations, you will want a large hole (f/1.8 – f/4) to maximize the amount of light that reaches the sensor. This will allow for a faster shutter speed. A faster shutter speed will reduce the chance of subject and camera movement, resulting in a sharp image. The aperture also controls the depth of field – what is in focus and what is out of focus in your photo – more about this later. DSLR cameras and some point-and-shoot models have semi-automatic modes where you set either the exposure or the aperture and the camera takes care of the other setting automatically. This makes it easy to experiment with various shutter speeds and apertures individually. Is this sounding complicated? Don’t worry – all it takes is a bit of practice. It’s worth it when you begin to produce great photos every time – in focus, clear and sharp, and with the exposure that you see in your mind’s eye. You may need a flash in some low light situations. Most times the flash included with the camera is adequate, but there are times when you will want to backlight or sidelight your subject. This is where an external, detached flash comes into play. It can be controlled remotely and can be located anywhere to give you the desired lighting effects. There will be times when you’ll want to use a smaller aperture in a low light situation for a greater depth of field – keeping everything in your photo in focus. Sometimes using a flash is inappropriate. These situations require a tripod to hold the camera steady for a longer exposure. You cannot possibly hold the camera by hand and obtain clear photos with long exposures. Mounting the camera on a tripod ensures it will be steady – and setting the timer delay will allow you to be in the photo too. There are other settings sometimes overlooked, such as the ISO number. ISO is the sensitivity of your camera’s sensor to light. A high ISO number increases your camera’s ability to produce photos in low light situations without using a flash or tripod. There is a drawback to increasing the ISO number. The higher the number, the grainier your photo will be when enlarged. Experimentation will determine what will work for your camera. Now that you know how to change settings, it’s time to think about the type of photos that you want to have on your site. Maybe you would like to display a photo of the church’s exterior. Wide and high buildings are sometimes difficult to photograph. If you have a wide-angle lens, this is a good time to use it. If you don’t have a wide-angle lens, you can use the “panorama” feature, if your camera has it, where several photos are “stitched” together for a wide-angle view. People pictures are a great way to display church events. Sometimes you don’t want a distracting background in the photo, just a person’s face – you need a “shallow depth of field” to render the background out of focus. This is where knowing how to change the aperture settings is beneficial. Opening the aperture all the way (a small number such as f/1.8) will throw everything except the subject of your photo out of focus. If you want the subject and everything in the background in focus, use a small aperture setting, such as f/22. Remember that a small aperture will allow less light into the camera, so you may need a flash or a tripod for clear images in low light conditions. Apply the simple “Rule of Thirds” to your photography. The Rule of Thirds is a method of dividing the scene into thirds with imaginary horizontal and vertical lines. This creates four places where the lines intersect. Place your subject close to one of these intersections – it will make a huge difference in the composition of your photos. Once you’ve finished making your masterpieces, you’ll need to download them to your computer, where you have the option of manipulating them with a photo-editing program. You can brighten or darken your photos, bring out specific colors, change them to black-and-white, sharpen blurry photos – the possibilities are almost unlimited. You can make changes manually, or use the automatic settings included in your program. Once again, learn how to use the controls and settings. You can improve almost any shot with photo-editing software. Photography is a great hobby. Investing a little time each week practicing your knowledge of your camera’s settings will result in good photos that you can display confidently on your church website. You can also save money otherwise spent on the services of a professional photographer. Camera equipment can be expensive, but it’s not necessary to spend a lot of money. The best cameras produce awful photos if not used properly and there are many beautiful shots captured every day with a cell phone. Learning how to use the camera you have will make the biggest difference in improving your photos. Know your camera’s settings and practice using them. Learn to properly expose your photos – shutter speed and aperture. Apply the Rule of Thirds. Use a tripod. Know when to use a flash. Learn how to use your photo-editing software. Most importantly, enjoy yourself!